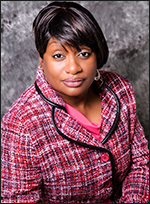 Ms. Brown is an experienced agent and has over eight years' experience in New York and Virginia. She particularly enjoys working with first time home buyers, which is something not every agent can do. Lisa is a kind, patient and a natural teacher. She keeps abreast of the foreclosed properties and entry level residential. She is also knowledgeable about the multitude of programs available to get people into their first homes with as little money needed up front as possible. Lisa can explain, USDA no money down loans, NC Housing loans, FHA including FHA rehab loans and down payment assisted loans as well as VA and Conventional. If you are a first time homebuyer or an investor and you want a knowledgeable, kind and caring Realtor who prides herself on attention to detail just contact Lisa Brown. Although Lisa is an experienced Real Estate Agent she and her husband James are relatively new to Goldsboro, they are located here to be closer to family. They purchased a home and found a church home at The Lord's Table and are looking for ways to get involved in the community. Lisa retired from the NYPD after 22 years where her career included both civilian and uniformed services. Lisa knows how to work with people, Lisa knows real estate and working with people one on one to find a way for them to achieve their dreams is what she does best. Berkshire Hathaway Home Services McMillen and Associates are fortunate to have her and our community is too.